All kinds of tasks that we take for granted every day are a real challenge to astronauts, who are trying to live and work in an environment with no up, down or sideways. One everyday task is drinking coffee. 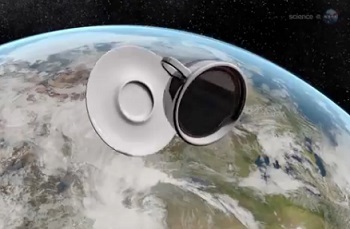 It can be difficult to prepare coffee in space, but it can be even more difficult to drink from a coffee cup. 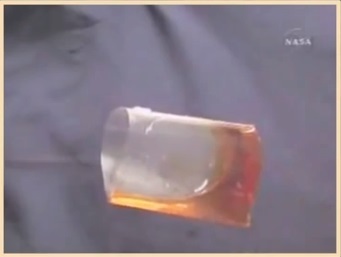 The action of drinking from a coffee cup is the result of gravity holding that coffee in that vessel – something that isn’t easy to replicate in space. But a simple thing like drinking from that coffee cup can be a familiar and soothing thing for someone out in space, which is why scientists set out to see if they could design a coffee cup that could be used in space. The cup looks like a bag, with one very sharp crease in the side. When liquid is pumped into the bag, it becomes trapped at the end of the bag, then naturally pools along the sharp crease – not because of gravity, but because of a phenomenon known as capillary action. You could easily sip the coffee from the corner of the “cup” that the coffee collects against – no gravity required.